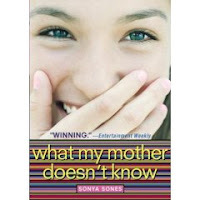 What My Girlfriend Doesn't Know by Sonya Sones. Grades 7 and up. Geeky, artsy Robin Murphy doesn't have any friends at school and he knows that the girl of his dreams would never stoop to being with a loser like him. But the thing is, Sophie actually does love him back. It's almost too good to be true. In fact, it's really too good to be true. At first Robin's afraid that their winter-break romance will be over once school starts again, but to his surprise, Sophie doesn't seem afraid to show her feelings for him. Unfortunately, there is some backlash. Sophie's friends ditch her and overnight she's as much of a social pariah as Robin has always been. And it's all Robin's fault. This novel in verse is a great depiction of adolescent romance and it's so neat to see it from a guy's perspective. Sones really gets that need that comes with a first love. That need to be with your significant other and the heartbreak that happens just spending a weekend apart. Just as interesting as the romance is Robin's experience taking a college art class and making some friends. I want to run after her. I want to wrap my arms around her. I want to tell her that everything will be okay. she'll know I've been eavesdropping. maybe everything isn't gonna be okay. Although What My Girlfriend Doesn't Know is a sequel, it can definitely stand alone. However, do yourself a favor and check out What My Mother Doesn't Know because it's also totally awesome. WMMDK, another novel in verse, is told from Sophie's point of view and it's another great book for first romances. Sophie starts out dating the smokin' hot Dylan, moves on to a cyber crush on Chaz from the internet, and then realizes that she has feelings for the most unlikely of boys, the loserly Murphy. In both books I think Sones has really captured the feelings of first loves and of adolescent crushes and friendships. Two thumbs up. You can find other reviews of WMGDK at Becky's Book Reviews and at Young Adult Book Reviews.